I stepped away from blogging for a few weeks to focus on getting the last little bits of my newest book turned into my editor and to knock out some major MY LITTLE PONY Fair 2013 planning. I’ve been also doing quite a bit of traveling and it just seemed that at the end of the day, after I had taken the time to answer the piles of email in my inbox, I just didn’t have have the energy to write a blog post. Here’s to hoping that I’ll be able to update a little more frequently! I did manage to survive the winter months despite my loathing of the cold. It helped that I visited some warmer places to break up all the chill and gloom of the Midwest. 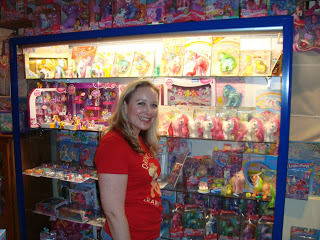 At the end of January, I traveled to Los Angeles, California and had the pleasure of being interviewed about both the 2013 MY LITTLE PONY Fair and my upcoming My Little Pony Collector’s 2009-2012 Inventory for an episode for the Brony Clubhouse Network. 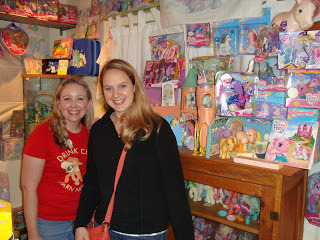 I was able to visit with my friend and fellow collector, Cayci and tour her pony room. I met Cayci years ago at a collector event . She has such a bright and bubbly personality and is just a fun person to be around. Plus, she has a pretty great collection! She goes by the name “Baby Medley” on the MLPArena, and she has an amazing Medley collection to go with her nickname! In case you missed the episode when it was initially posted weeks ago, I’ve included a link so you can have the pleasure of watching me stumble over my words. You can also see my husband, Matt, stand there and look awkward. I just kept blabbering on and on and never really gave the poor guy a chance to chime in on anything. 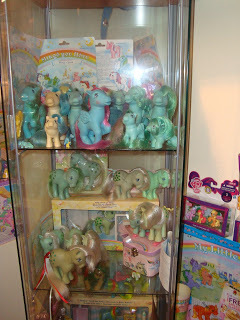 I guess it goes to show that when it comes to Ponies I never really run out of things to say! Just listed on 11/13/08! Better grab these items before someone else does!